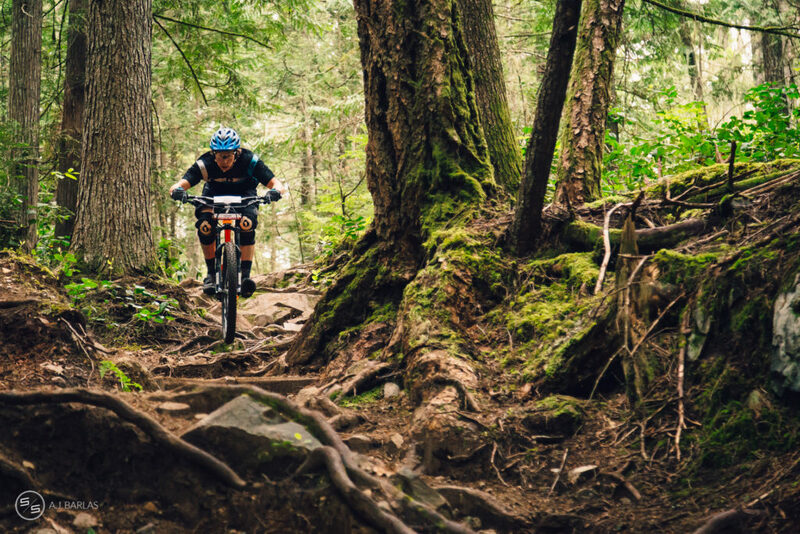 After what’s been somewhat of a small hiatus, last weekend the Sea to Sky Enduro Series swung into gear again with the second round, this time in Squamish. 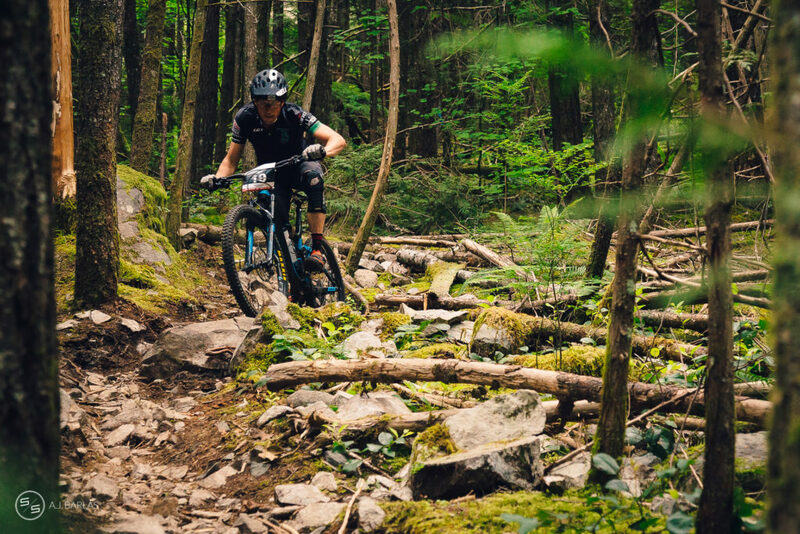 The Gryphon—the event that kicked off the series last year—saw close to 140 riders hit the trails despite questionable weather early on. 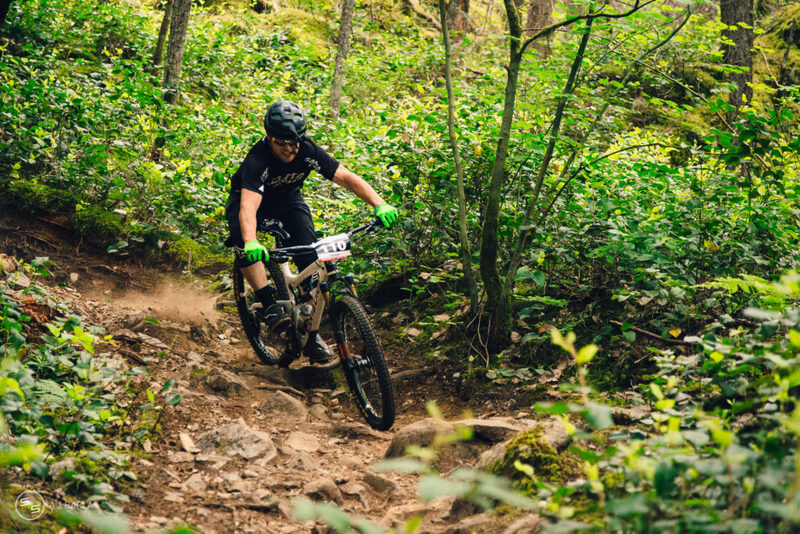 In what has become a regular occurrence at these local enduro events, a number of riders battled on the first stage with early race jitters, resulting in a number of competitors kissing the dirt, or just straight up having self-proclaimed, horrible runs to start the day. It showed in the results too, with a number of eventual podium finishers not quite there at the end of this first stage, but seeing far better results on the following segments. No-one can really blame them though, because even if taking away that it’s a race and participants get a little jittery, Made in the Shade is an awkward beast to ride, with her tight, cumbersome corners. As a result, more than a few racers weren’t too fond of the kick off stage with a few questioning the merits of it being a part of the race at all. Regardless, most got it over with and those that felt good left for stage two with confidence, while those that had a rough go shook it off and got on with the rest of their day. 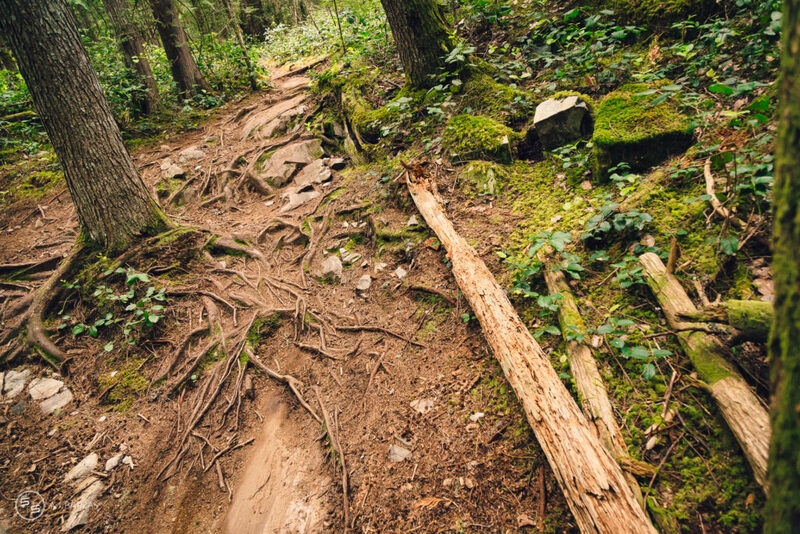 The winter of 2014/15 has been a tough one for the trails of Squamish. With little in the way of snow for winter frothers to goof off in, many residents and out-of-town visitors have kept up the dirt churn, resulting in trails being more worn than usual. While still offering good times and many of the stages for the race remaining favourites for locals and visitors alike, it meant that they were more challenging in some places than say, 12 months ago. It was as if some parts of the trails had already seen a race of this nature on them, taking on the post race appearance, pre-race. Despite this conditions for the day were near perfect, with the recent evening showers being just enough to keep the dust levels down and add a little extra traction to many areas of the course—perfect for pushing tires to dirt with some purpose. In fact, with exception to the last part of the last timed segment of the day, all stages had a perfect mix of conditions. It was only on this last stage that the final trail, Kiki, was drier, thanks to it’s still super loam carpet most of the way down, and south-facing aspect. Even so, without the steep ‘chute’ section of this stage many would have had no complaints, not even those crying out about the photographers being in the ‘sandy’ parts of the trail, and even with those that did sing out, guaranteed they still finished with smiles on their dials. 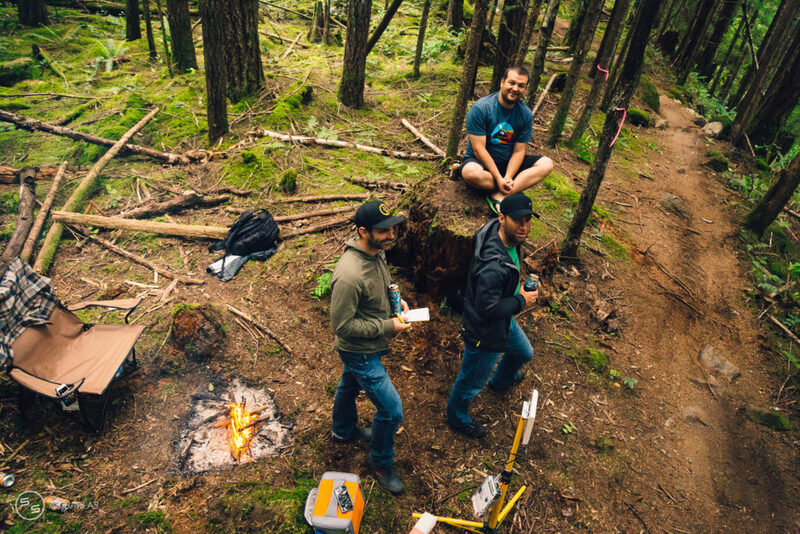 The timing of this year’s race meant that a number of regulars were not present, the most notable of these being Pro category racers like Jesse Melamed (who remains undefeated in the Sea To Sky), dingo Dylan Wolsky and Davis English, who were all racing bikes in Ireland as part of the EWS. It gave way for many others to show what they’ve got and show it they did. One such rider that left jaws on the ground was local lad, Eric Goodwin. Eric raced a 15km run earlier the same morning, and won, but determined not to miss the action, he rolled into the start area right on queue to kick off his race. He continued to set standards, being one of the top 3 racers through on every stage of the day and finished 5th in Open Men, a division stacked with local heavy hitters. After the first stage threw curve balls at riders and stage two saw the fitter racers come out ahead in some cases, the field seemed to settle into a rhythm come stage three, one that continued through the rest of the day. Almost all categories saw eventual podium racers with consistent and fast results through stages three, four and five though there were exceptions and some close calls. 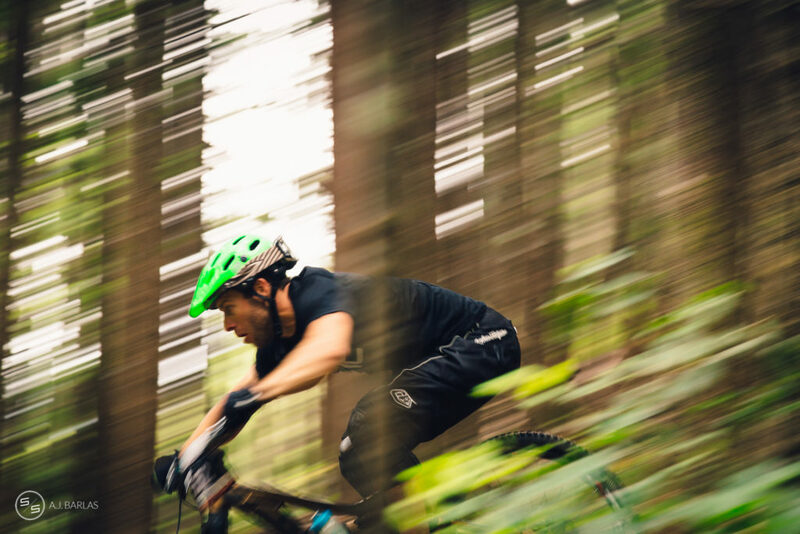 In Masters Men, Sea to Sky Enduro Series regular and Santa Cruz destroyer (tester), Craig Wilson came out swinging, with solid times and positions early on, only to step it up and take the ‘W’ on stages three and four. Judging from the results sheet, and what looked to be his helmet visor in his mouth on stage five, it seems he may have bit it, rolling out a sixth, his worst result of the day and putting him in 3rd overall. Had he maintained his consistency, say 3rd at worst, he would most likely have taken the win. First and second in Masters Women were incredibly consistent throughout, but there was no stopping Tamsin Mills, who won every stage through the day to finish 41+ seconds up on her nearest rival, over an 18–19 minute race. 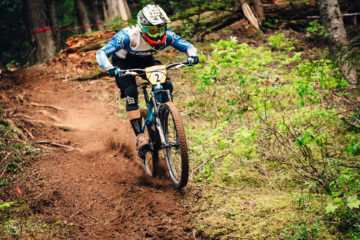 Speaking of her nearest rival; Meghan Illingworth, an experienced DH racer, came out of retirement and showed she still has what it takes! Meghan showed she’s still wicked fast and has some lungs too, putting down consistent runs throughout the day (a series of 3rd, 2nd, 2nd, 2nd, 1st) and taking the win on the last stage, Crouching–Kiki, one of her all-time faves. In Open Men, we saw local sender and now cross-fit aficionado, Pat Foster, show that consistency pays, pulling the win off among stiff competition. The podium has been alluding Pat in the last couple of races and it was good to see him get there, in the top spot, and in front of the home crowd. Pat did so with some authority as well though a 6th on stage two (Rupert), almost dashed his chances of the top step. All said and done, Pat finished up the day nine plus seconds up on good friend Jeremy Norris, who put a bit of time into Pat on stage two, but the division as a whole saw some tight racing. Ben Hoffman, another part of the dingo clan, came out and showed that he’s got speed, not to the surprise of any of his riding partners. Ben’s pinned, has a strong skill set and is incredibly humble, leaving many stoked to see him get a result. In Open Women’s it was smooth sailing for Christina Chappetta, almost too smooth, taking the win on every stage of the day and posting a time that would have placed her sixth in Pro Women. Local gal, Annie Gaudette, had a strong race with a host of second place finishes a third and a fourth, seeing her close out the day in 20:03.95. Fellow Squamite, Karen Mann, finished on the same minute, just four seconds back. Junior men were buzzing all day, with the crew riding together for most of it and no doubt heckling all the way! They were entertaining, energetic, and it was eventful, with some of the most inconsistent results of the entire field. The only really consistent rider was Jesse Mc Auley, though a flat on stage five and realizing he had lost his pump earlier, cost him the race. Prior to this, Mc Auley had won every stage with the exception of the first, which he finished second on. Had he not flatted he would have without a doubt won the race, but that’s racing. In the end it was Jack Cormack that took the win, with a range of second place finishes to his name and a final time that was closing in on two minutes ahead of second place, Jacob Murray. Kasper Woolley finished the day with a podium, despite smacking his face pretty good on stage three (Entrails), which was his worst finish of the day, otherwise finishing in the top three throughout. Woolley lost enough time on his stage three crash that had he finished in form with his other results, he would likely have jumped up a step on the podium. Rest up the swollen face Kasper, and hopefully we’ll see you at another one of these before the end of the year. In Pro Men, Rhys Verner showed the field that he’s faster and more fit. With the exception of the first stage, one that he struggled with, Rhys won every segment of the day and did so while putting close to 14 seconds into his nearest competitor, a margin; however, that he couldn’t repeat again during the day. It didn’t matter though, because Rhys, who could technically still be racing in the junior category, rode strong and consistently throughout the day and wound up with a 27 second lead on the competition when all said and done. Whistler lad and another of the dingo migrants, Shane Gayton, put in a solid string of results to take the second step of the podium, with a healthy 20 second margin over third placed, Greg Grant. Gayton’s worst result came as a result of tape being placed on stage three where no-one was expecting, and he wasn’t the only to have issues with it. Pro Women winner was series regular, and race frother, Leonie Picton. Leonie’s been on fire this year and continued her stellar form into The Gryphon, taking out every stage other than the first one, where she came in second to Sarah Leishman. 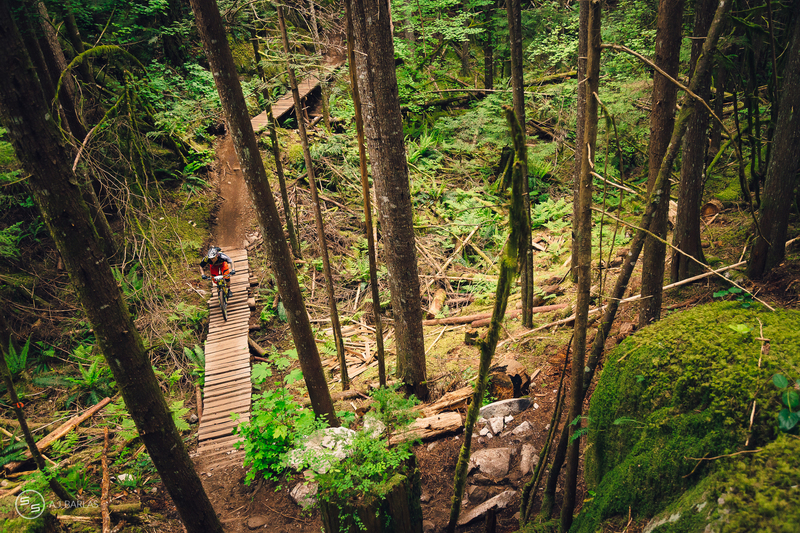 Speaking of Sarah—we were stoked to see her not only back on her bike, but back racing. 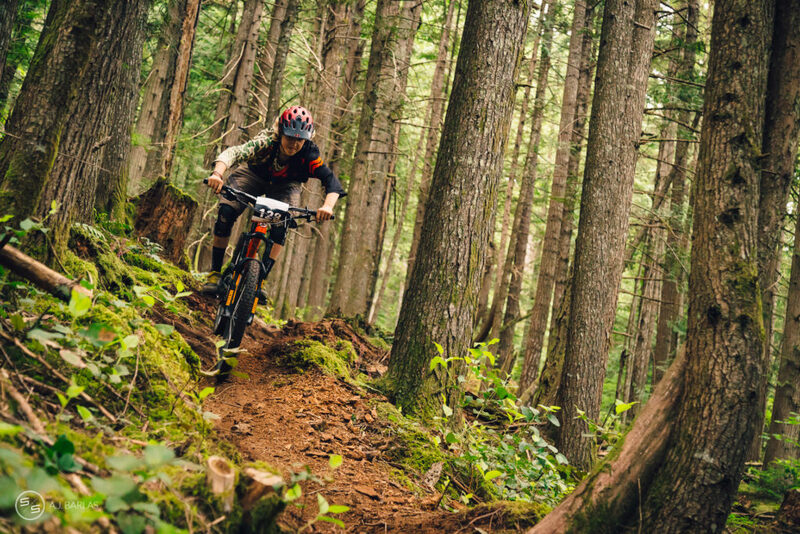 She’s still battered from her injuries sustained at the first Enduro World Series event in New Zealand, but is patiently building strength and definitely appears to be continuing to build some serious fitness. Sarah finished the day in third place, almost a minute back from Leonie, while Emily Slaco filled the void, taking out second place and continuing to rip apart mountains on her new ride. Slaco finished on the same minute as Leonie, some 24 seconds back.